During this class, we will work on a painting similar to this one. Swans have always intrigued me with their beauty and grace. I think there are two reasons for my love for this majestic bird or perhaps three. First, my mother had a ceramic swan planter in her beauty shop. I always admired it even though it had a broken wing. 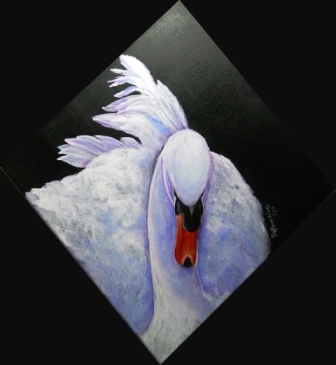 To me the flaw never detracted from the swan’s beauty. After all, the plant hid the wing, which was on the side that always faced the wall. No problem. When my mother retired, she gave me the swan. I still have it and still admire it. Like mother’s swan, we all have flaws—some more obvious than others. But God overlooks our imperfections when we seek redemption through Jesus Christ. At that moment, Jesus covers us with His righteousness, making us acceptable to the Father. Second, I’ve always loved the story of the Ugly Duckling. I resonated with the poor little bird constantly being teased, ridiculed, and rejected. I felt that way as a child, therefore, the tale of the Ugly Duckling gave me hope for a beautiful future. Someday, I’d be a graceful swan. Well I didn’t turn out as beautiful and graceful as a swan, not physically anyway. However like the Ugly Duckling, I’m transforming gradually into something far more admirable than a swan. After I became a Christian, God started the process of shaping the image of Christ in me. I’m far from completion. Most times, I don’t even see a resemblance to Jesus in me. However, I trust God’s promise to finish the work He has begun in me. I like that God’s mercies are new every morning. That means, every morning He restores the image of Christ in me and continuously works His plan to the end. How about you? How has God showed His new-every-morning mercies to you?